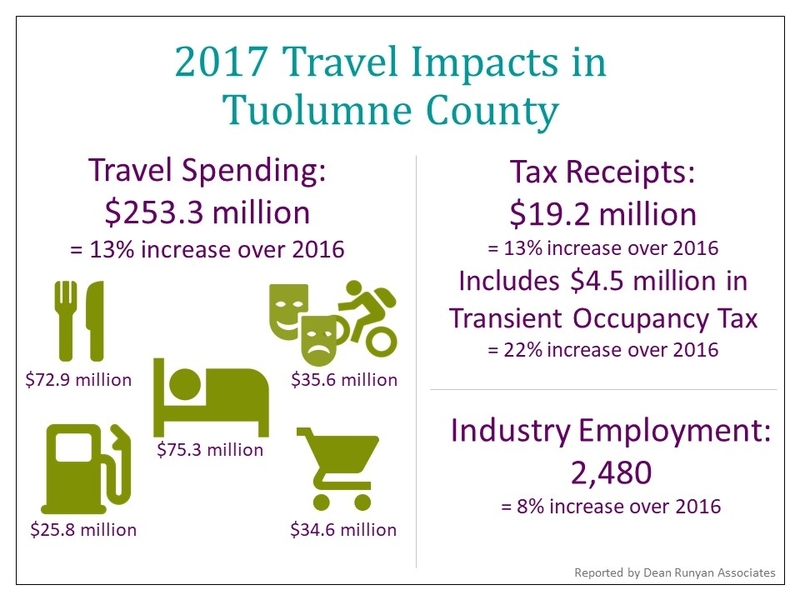 The Tuolumne County Visitors Bureau is pleased to announce that Visit California has released the 2017 Travel Impact Report prepared by Dean Runyan Associates. The research results for Tuolumne County are worth celebrating. The numbers from 2016 to 2017 demonstrate a significant increase in direct travel spending, employment and tax revenue at both the state-level and county-level. - Transient Occupancy Tax (TOT) is paid by visitors to our County and is a benefit to everyone who lives in Tuolumne County and the City of Sonora. - The Tuolumne County Visitors Bureau is funded by 25% of the collected TOT, allowing Tuolumne County to be marketed as a tourist destination across multiple channels nationwide and internationally. - 75% of the collected tax revenue goes towards infrastructure, parks and other important public services. - TOT dollars are the only tax dollars that stay 100% local! - The tax is collected from guests who stay at our local hotels, motels, B&Bs, vacation rentals, cabins and other short-term lodging. - TOT is not a tax on businesses. - The collection of TOT reduces the tax burden for local residents. - TOT rate in Tuolumne County and in incorporated Sonora is 10%.